Based to the World Health Organization (WHO) data one in four people in the world will be affected by mental or neurological disorders at some point in their lives - for example anxiety, panic, mood disorders or low motivation. Based on my broad experience with clients I can say that mental problems are becoming a normal part of lives of many people. There is too much of something (anxiety for example) or too little of something (energy, joy or self-confidence for example). That is something that damages the quality of life and prevents people from living a "normal" life. Even when everything is "normal" and "life is good" there is a high chance that you are internally not happy and not living a rich, full and meaningful life. Discontent with the surroundings, postponed dreams or unreachable career goals seem like inevitability, right? Despite the wide presence, psychological disorders and dissatisfaction with self and the life the person is living are like the pink elephant in the living room - everyone know that he is here, but nobody dares to name it, even less talk about it. Really often I hear from people who have battled years with depression, anxiety or relationship issues that "things are still not that bad" or "perhaps it will pass by itself". They are also not looking for help because they are ashamed, they will see talking to a psychologist as a sign of weakness an they are afraid what others might think. But to be honest, for example anxiety and phobias are some of the easiest psychological disorder to treat and dissatisfaction with self is not a personality trait you have had since you were born like the colour of your eyes that you can only hide from others by wearing really dark sunglasses. Counseling is a structural approach that is time efficient and uses evidence based techniques (cognitive - behavioural approach for example) to treat serious psychological disorders. develop new skills to overcome your problem. Coaching is structures co-operation relationship and a process that as a specific goal that allows you to use the maximum potential within you in your personal and professional life. live a rich, full and meaningful life based on your values. As a coach and a psychologist I hear very often people saying with a loud sigh: "I will try to deal with my problems myself". And I couldn't agree more! 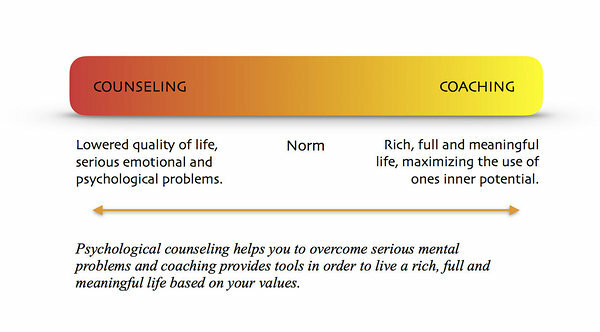 Coaching and counseling will provide you with the tools that you are going to use to overcome those obstacles.